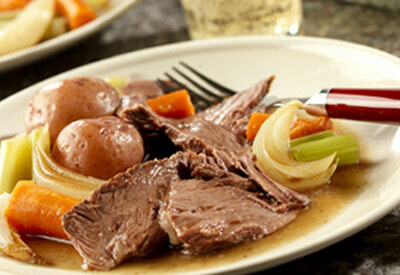 Browning the pot roast before you add it to the slow cooker gives it added richness as it cooks to ultimate goodness. Heat the oil in a 10- inch skillet. Add the beef and cook until well browned on all sides. Place the potatoes, carrots, onions and celery into a 3 1/2- quart slow cooker. Top with the beef. Stir the soup, consomme and water in a small bowl. Pour the soup mixture over all. Cover and cook on LOW for 10 to 11 hours or until the beef is fork-tender and the vegetables are tender. Season with the black pepper and tarragon.